Mason and Todd Herderhurst are new to the hunt test game. Todd sent us an update on how Mason was doing with his training last week. Mason is one of our Rowan/Leia puppies from the October 2012 litter. Mr. Mason, you look good in pink! "Just a quick update. Today Mason and I got out feet wet in the retriever test world. My golden retriever club was having wc/wcx and was also offering a puppy stakes. 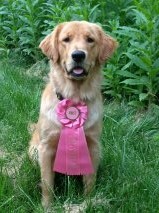 We ran the puppy stakes and Mason did fantastic. Everyone was very impressed with him, including me. People seem to think he is capable of big things. The test consisted of two land marks and two water. The land marks were 50 and 75 yards in knee high cover. He nailed them both. The water was much easier than what we normally do in training, about 30 yards in light to no cover. Although one of the water marks was really inviting the dog to cheat Mason did great and avoided that trap. We ended up winning the upper division (7-12 months). I am so proud of him. Thanks for breeding such wonderful dogs."